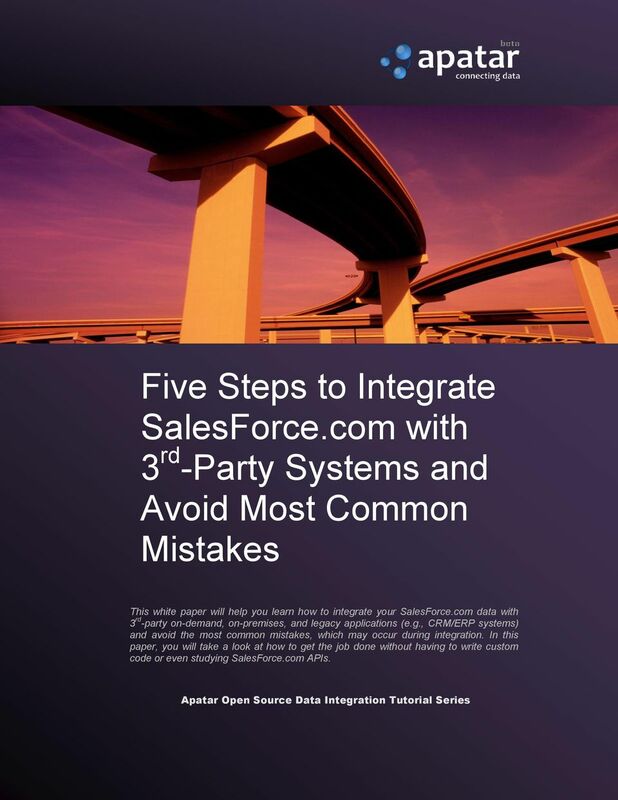 Download "Five Steps to Integrate SalesForce.com with 3 rd -Party Systems and Avoid Most Common Mistakes"
3 3 of Executive Summary Corporate developers spend approximately 65 percent of their effort building bridges between applications. -- The Gartner Group Companies of all sizes are challenged to deliver their products and services to market faster and to manage more complex sales and marketing programs with limited budgets and decreasing time frames in order to accelerate revenue generation. Salesforce.com represents a tremendous opportunity for companies to solve these challenges by leveraging its proven, non-intrusive and scalable on-demand platform. To fully leverage the benefits of using Salesforce.com, companies must realize the need to integrate customer-facing business processes with the rest of the enterprise. Today, when hosted CRM software is becoming mainstream, a typical company using SalesForce.com has to figure out how to connect the information residing in Salesforce.com with 3 rd -party systems, such as ERP, accounting and CRM packages, custom applications, and databases. Having the right data integration and data quality model is critical. 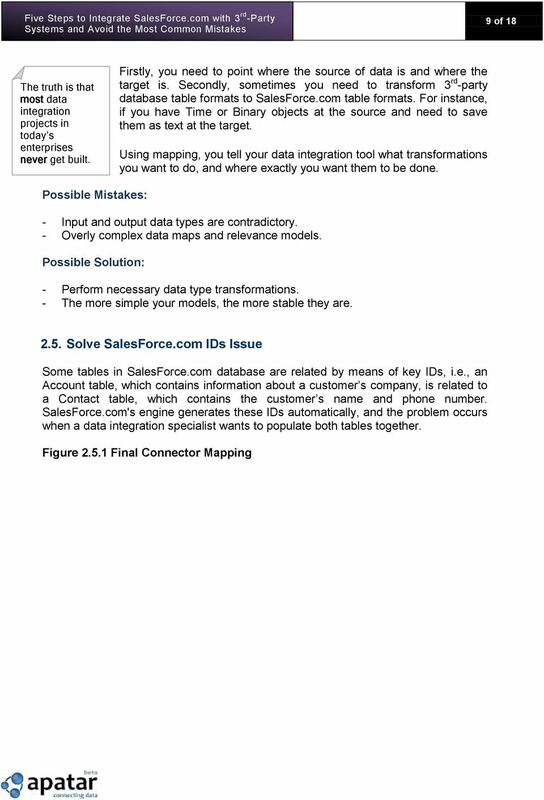 This white paper will guide you through the process of integrating Salesforce.com data with 3 rd -party applications and databases using freely available, open source application Apatar Data Integration. It will also provide a set of best practices and tips on how to solve typical challenges and avoid the most common mistakes. 2. 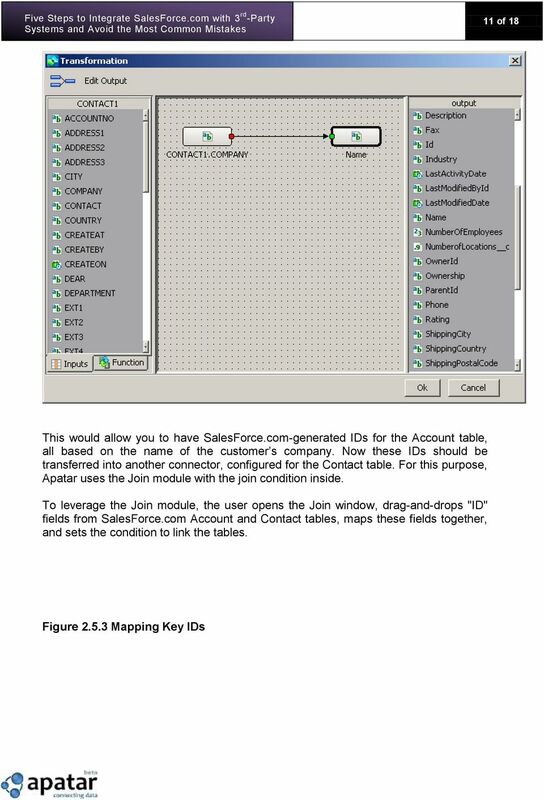 Integration Process At some point Salesforce.com customers realize the need to integrate their customer information between SalesForce.com and 3 rd -party systems and applications. 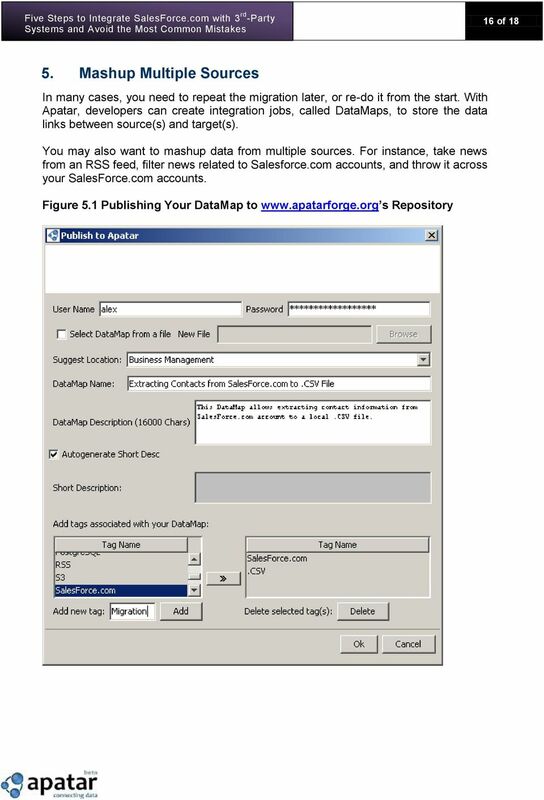 What steps should be taken to get your customer and enterprise information (currently residing in SalesForce.com) integrated, replicated, or migrated to your new Softwareas-a-Service package? 2.1. Preparation and Planning Prior to any data migration, ask yourself some questions to clarify the goals of the oncoming integration process. 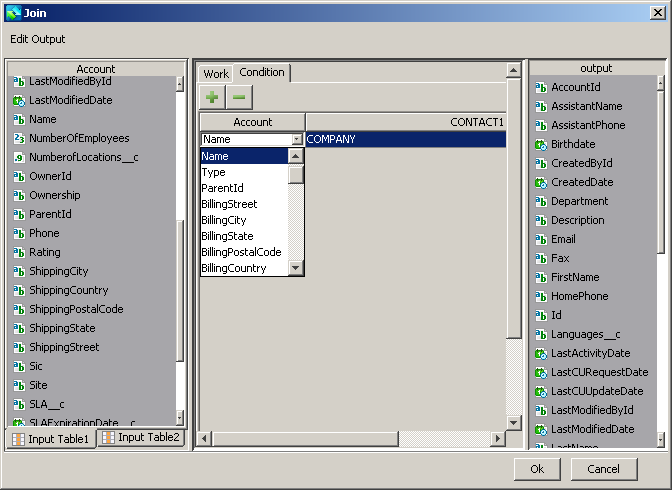 For data integration specialists, it is critical to know: What data (tables/fields/rows) should be extracted? What data (tables/fields/rows) should be considered as targets? 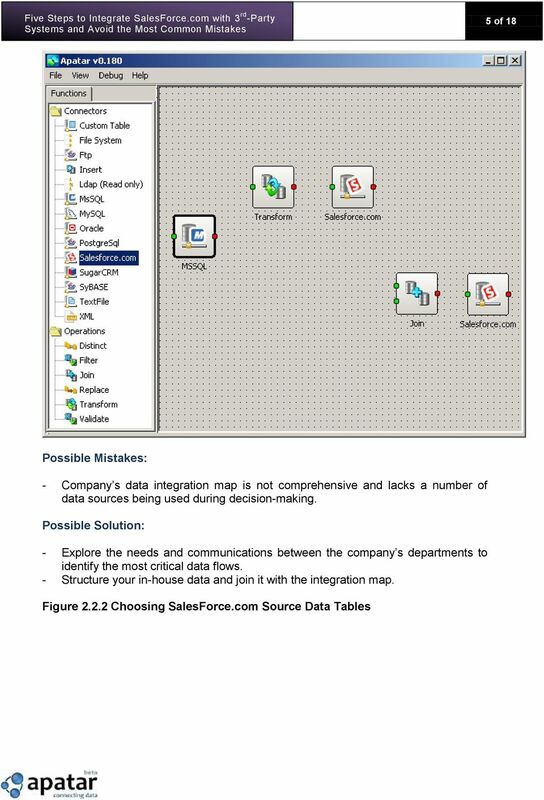 Do I need to integrate SalesForce.com with one single database or multiple data sources? Is it enough to perform a one-time migration, or do I need an ongoing synchronization? Do I need to have SalesForce.com data backed up? Do I have enough experience to do manual coding, or would the use of visual data integration tools be the best decision? 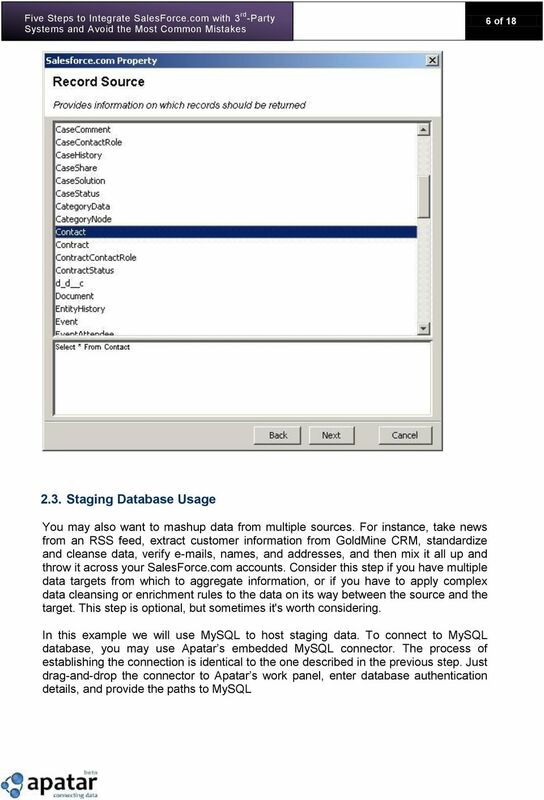 7 7 of 18 Figure Staging MySQL Database Usage Possible Mistakes: - Wrong validation or enrichment rules. - Data duplications. Possible Solution: - Set the filtration criteria, avoid loading odd information, and define data enrichment rules. - If necessary, consult with a data warehousing specialist Map the Source with the Destination According to The Gartner Group, corporate developers spend approximately 65 percent of their effort building bridges between applications. Luckily, today s data integration tools allow even non-technical users to integrate data between systems, databases, and applications. 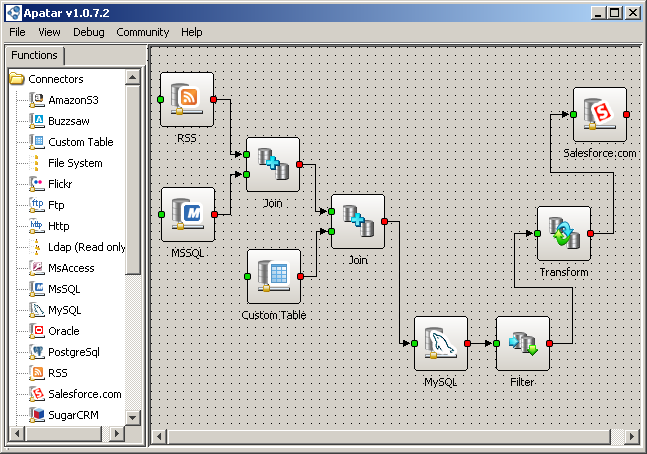 Imagine you could visually design ( drag and drop ) a workflow to exchange data between files (Microsoft Excel spreadsheets, CSV/TXT files), databases (such as MySQL, Microsoft SQL, Oracle), applications (Salesforce.com, SugarCRM), and the top Web 2.0 destinations (Flickr, RSS feeds, Amazon S3), all without coding. 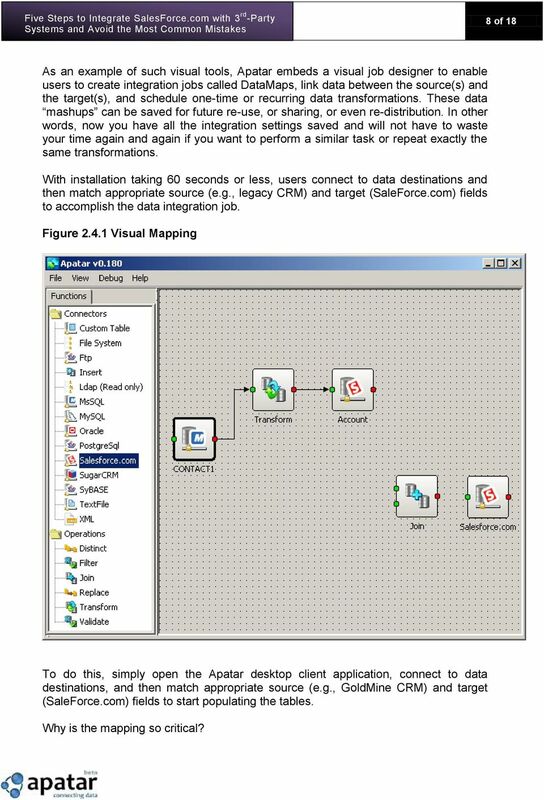 8 8 of 18 As an example of such visual tools, Apatar embeds a visual job designer to enable users to create integration jobs called DataMaps, link data between the source(s) and the target(s), and schedule one-time or recurring data transformations. These data mashups can be saved for future re-use, or sharing, or even re-distribution. In other words, now you have all the integration settings saved and will not have to waste your time again and again if you want to perform a similar task or repeat exactly the same transformations. 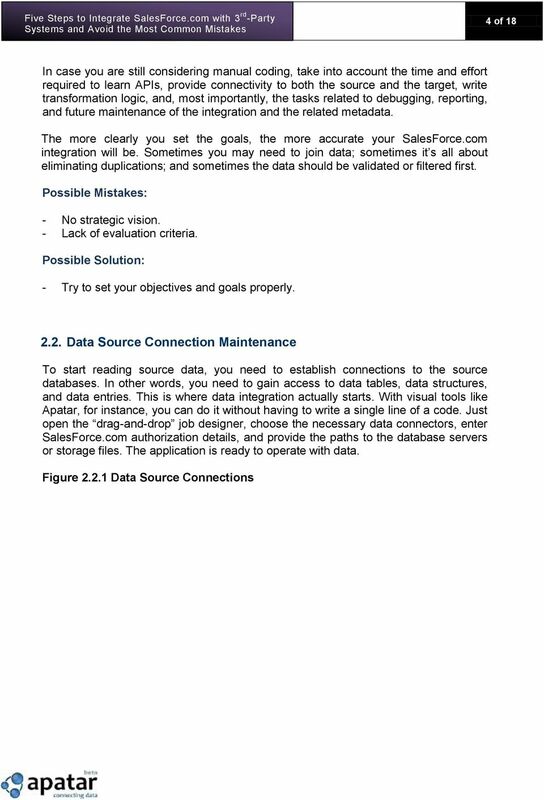 With installation taking 60 seconds or less, users connect to data destinations and then match appropriate source (e.g., legacy CRM) and target (SaleForce.com) fields to accomplish the data integration job. 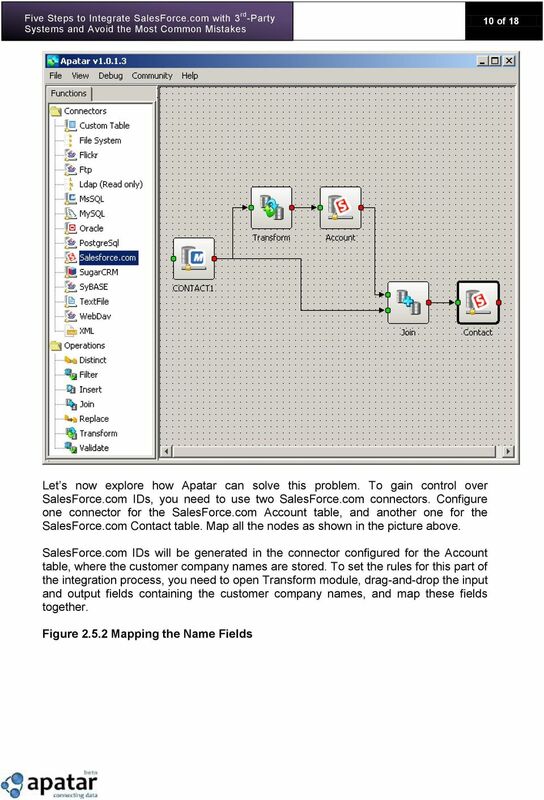 Figure Visual Mapping To do this, simply open the Apatar desktop client application, connect to data destinations, and then match appropriate source (e.g., GoldMine CRM) and target (SaleForce.com) fields to start populating the tables. Why is the mapping so critical? 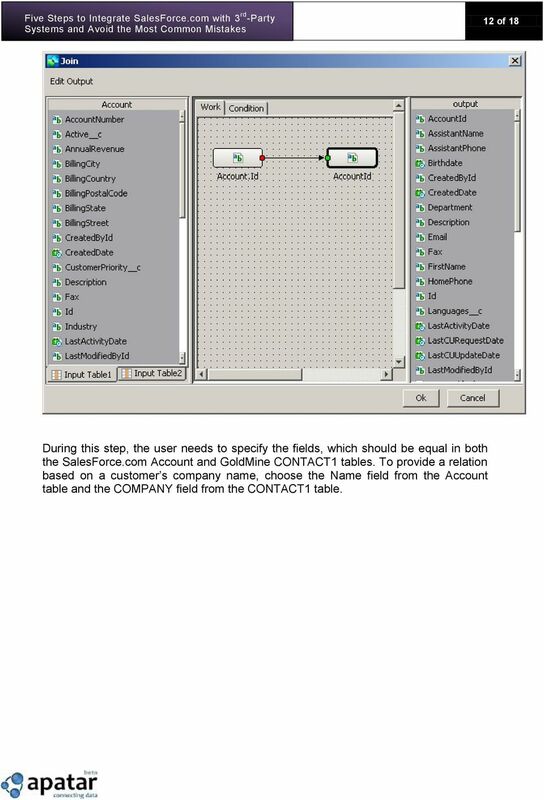 12 12 of 18 During this step, the user needs to specify the fields, which should be equal in both the SalesForce.com Account and GoldMine CONTACT1 tables. 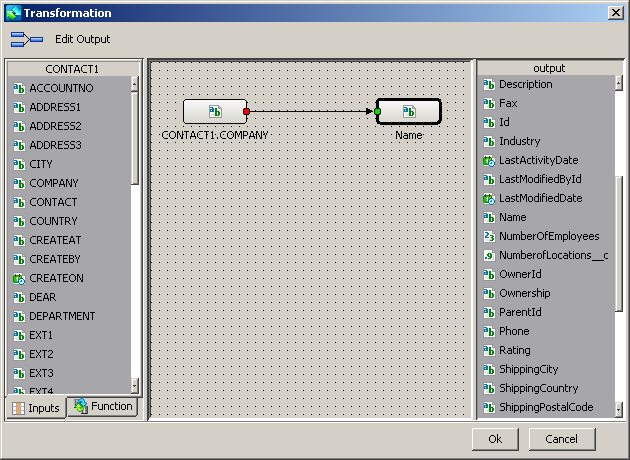 To provide a relation based on a customer s company name, choose the Name field from the Account table and the COMPANY field from the CONTACT1 table. 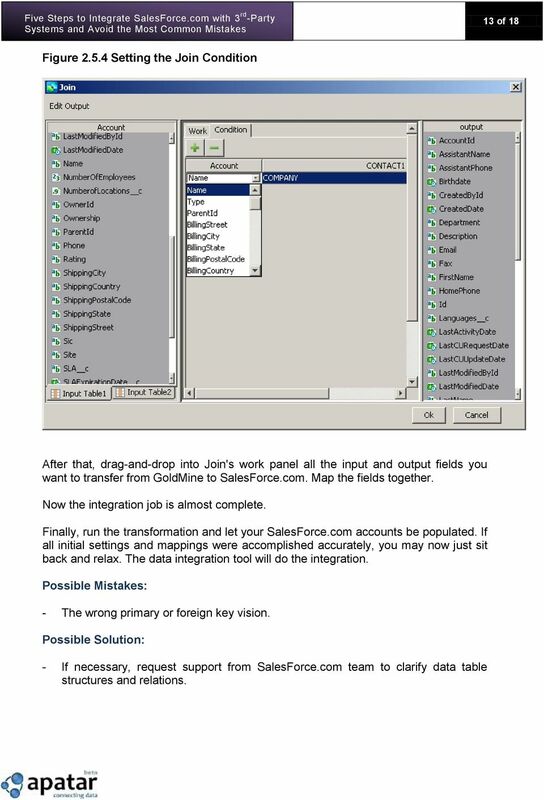 13 13 of 18 Figure Setting the Join Condition After that, drag-and-drop into Join's work panel all the input and output fields you want to transfer from GoldMine to SalesForce.com. Map the fields together. Now the integration job is almost complete. Finally, run the transformation and let your SalesForce.com accounts be populated. If all initial settings and mappings were accomplished accurately, you may now just sit back and relax. 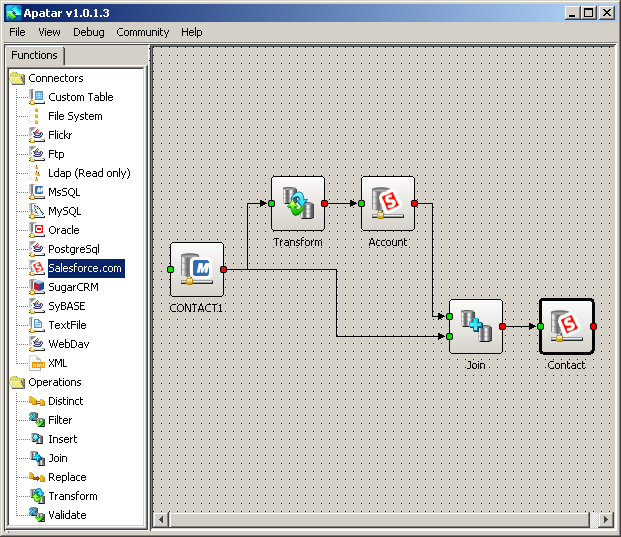 The data integration tool will do the integration. Possible Mistakes: - The wrong primary or foreign key vision. Possible Solution: - If necessary, request support from SalesForce.com team to clarify data table structures and relations. 14 14 of 18 Figure Fields Mapping 3. Recurring Integration Business data is never consistent; real-time updates, new data entries, and other changes require maintenance. 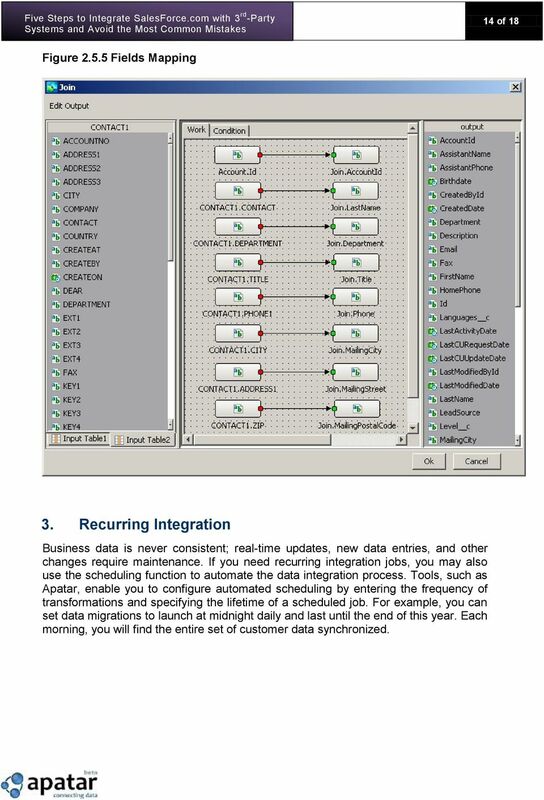 If you need recurring integration jobs, you may also use the scheduling function to automate the data integration process. Tools, such as Apatar, enable you to configure automated scheduling by entering the frequency of transformations and specifying the lifetime of a scheduled job. For example, you can set data migrations to launch at midnight daily and last until the end of this year. Each morning, you will find the entire set of customer data synchronized. 17 17 of Best Practices 1. 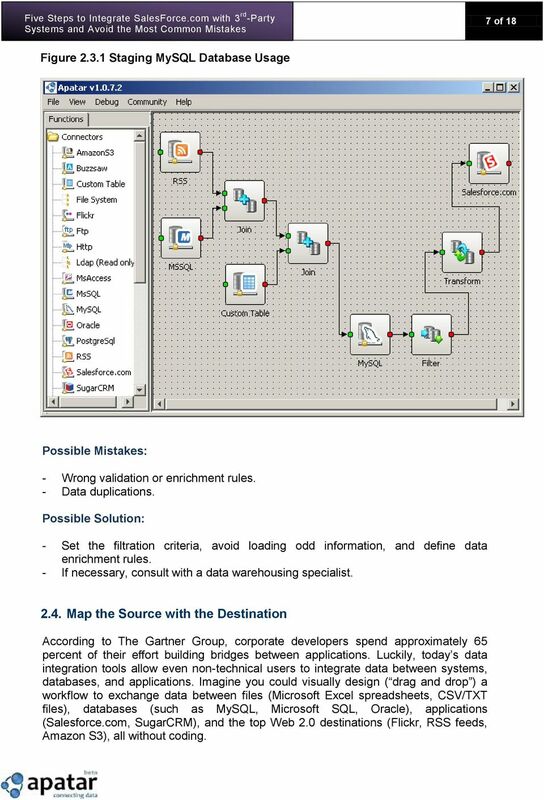 Formalize Data Schemas 2. Update the Information 3. Maintain the Integration 4. Go Open Source 5. Verify and Clean Up the Data 6. 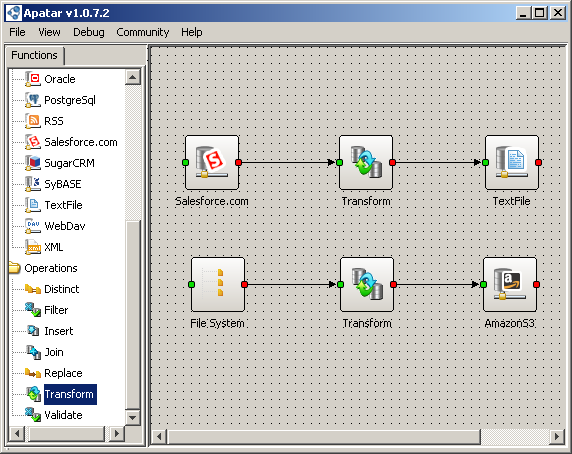 Transform Raw Data into Business Information 7. Consistence is a Key to Providing Valuable Data 8. 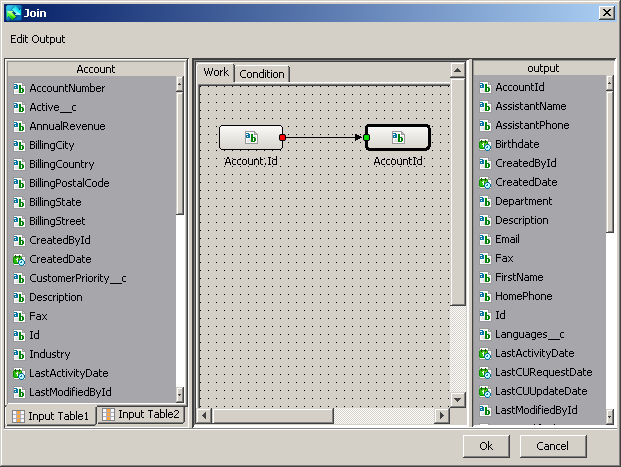 Stick to Business Value Custom objects, data fields, and tables created by individuals should be documented and align with all applications and processes within the integration environment, as well as be visible to other users. To enforce data standardization, it is recommended to start with defining initial data schemas and setting how the processes of subsequent changes to the data schemas will be made in the future. Information should be updated on a regular basis or, if possible, in real time. Out-of-date views are useless, so keep an eye on this. Even the most defined integration process requires maintenance. New tables may be added, data structures may change, and so on. If there s no one to take responsibility for the long-term success of the integration initiative, the process may fail sooner or later. Having no plan or budget for an ongoing integration is a mistake, which may become expensive to fix. 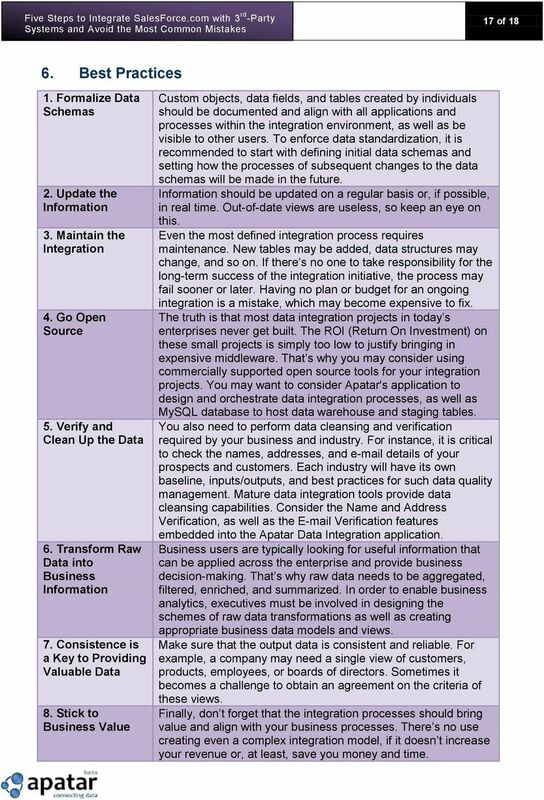 The truth is that most data integration projects in today s enterprises never get built. The ROI (Return On Investment) on these small projects is simply too low to justify bringing in expensive middleware. That s why you may consider using commercially supported open source tools for your integration projects. You may want to consider Apatar's application to design and orchestrate data integration processes, as well as MySQL database to host data warehouse and staging tables. You also need to perform data cleansing and verification required by your business and industry. For instance, it is critical to check the names, addresses, and details of your prospects and customers. Each industry will have its own baseline, inputs/outputs, and best practices for such data quality management. 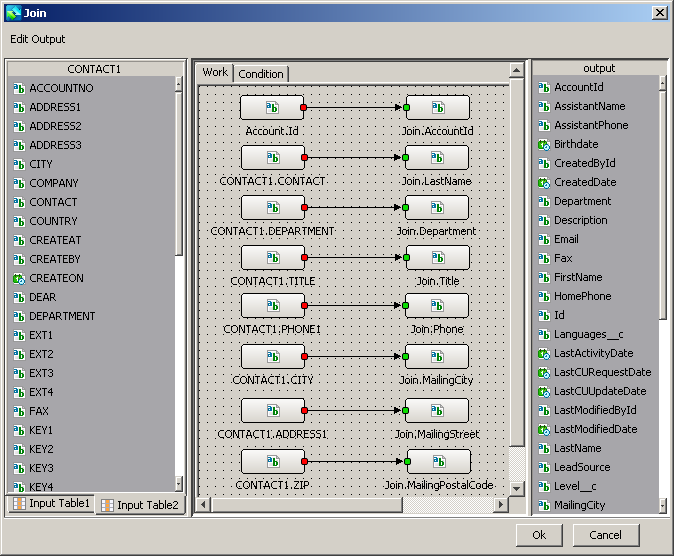 Mature data integration tools provide data cleansing capabilities. Consider the Name and Address Verification, as well as the Verification features embedded into the Apatar Data Integration application. Business users are typically looking for useful information that can be applied across the enterprise and provide business decision-making. That s why raw data needs to be aggregated, filtered, enriched, and summarized. In order to enable business analytics, executives must be involved in designing the schemes of raw data transformations as well as creating appropriate business data models and views. Make sure that the output data is consistent and reliable. For example, a company may need a single view of customers, products, employees, or boards of directors. Sometimes it becomes a challenge to obtain an agreement on the criteria of these views. Finally, don t forget that the integration processes should bring value and align with your business processes. There s no use creating even a complex integration model, if it doesn t increase your revenue or, at least, save you money and time. 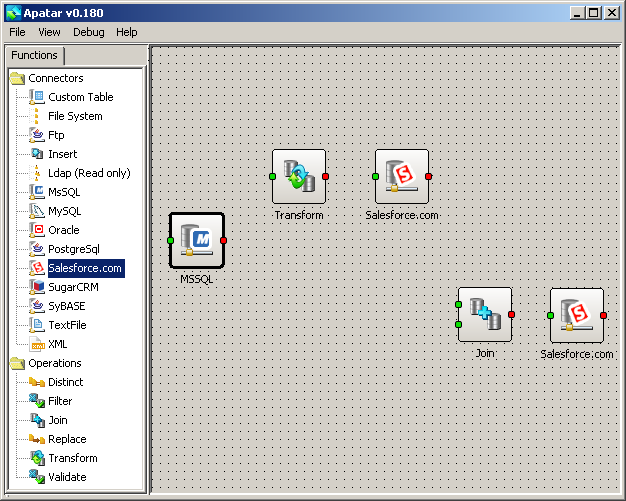 18 18 of Summary Integration with SalesForce.com may be easier than you think. You may want to try Apatar s open source tools and professional services for your next data integration project. With powerful data integration capabilities, thousands of Apatar users enjoy the benefits of using a visual interface and mapping capabilities, which provide even a non-programmer with all of the means to plan, design, and execute various data integration, migration, and replication jobs. Scheduling capabilities allow one-time or recurring transformation of information between Salesforce.com and 3 rd- party systems. With today s data management solutions, the business user has a powerful toolset not only to manage data streams within the enterprise, but to join data with the Web, keep it safely in SalesForce.com, and exchange information with partners globally. 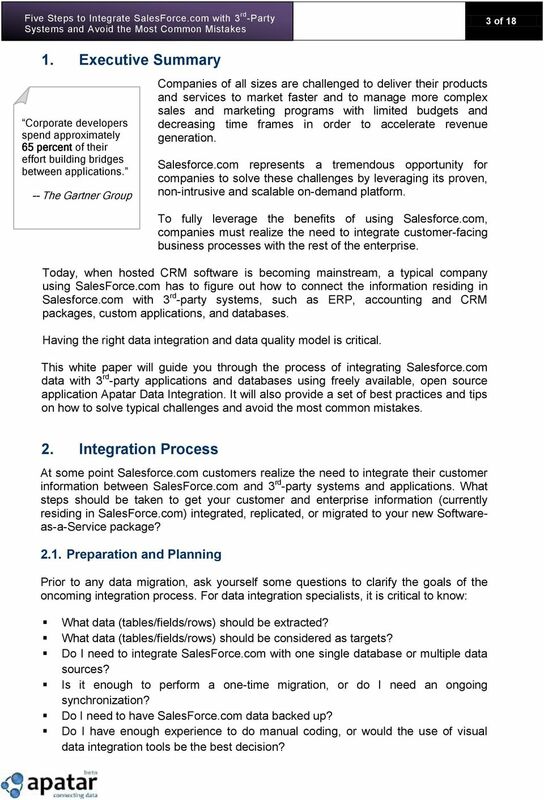 For a free download of Apatar Open Source Data Integration and more information on how to integrate SalesForce.com with other applications or data destinations, please visit or 8. About the Authors Renat Khasanshyn is CEO of Apatar, Inc. Alex Khizhnyak is Apatar Evangelist, Apatar, Inc. Apatar ( is the leading provider of open source software tools for the data integration market. 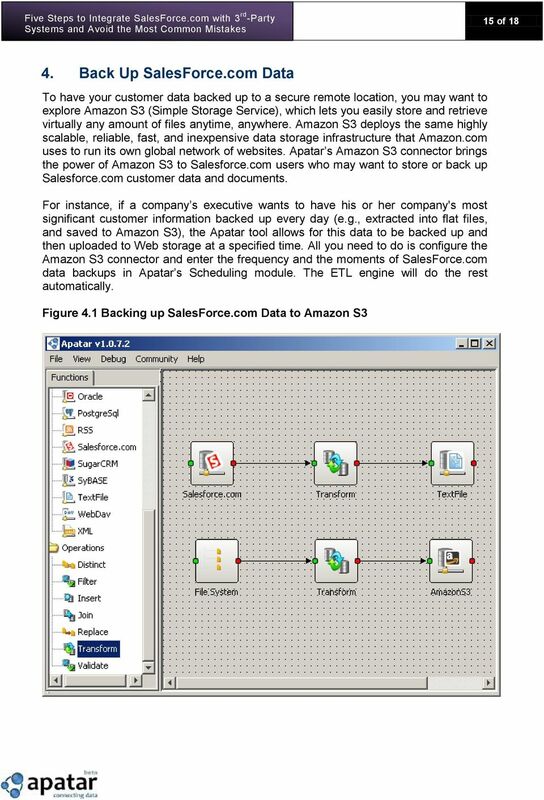 With powerful Extract, Transform, and Load (ETL) capabilities, Apatar enables its users to easily link information between databases (such as MySQL, Microsoft SQL, Oracle), applications (Salesforce.com, SugarCRM), and the top Web 2.0 destinations (Flickr, Amazon S3, RSS feeds). Apatar provides support, training, and consulting services for its integration solutions. Headquartered in Western Massachusetts, Apatar operates a development center in Minsk, Belarus. For more on Apatar, please visit and Apatar, Inc. All Rights Reserved. All Apatar brand names are service marks, trademarks, or registered trademarks of Apatar, Inc. in the United States and other countries. All other product names, brand names, or trademarks belong to their respective holders. White Paper. Thirsting for Insight? Quench It With 5 Data Management for Analytics Best Practices. ADVANTAGES OF IMPLEMENTING A DATA WAREHOUSE DURING AN ERP UPGRADE Advantages of Implementing a Data Warehouse During an ERP Upgrade Upgrading an ERP system presents a number of challenges to many organizations.